Saturday, November 1, 2014 - 1:00 p.m.
Wilkes returns home after a four-week road stretch welcoming Albright College for a Middle Atlantic Conference matchup at 1:00 p.m. at Schmidt Stadium. Wilkes fell 46-0 at Lebanon Valley College in its second straight away contest. Albright, winners of two straight, recorded a 30-24 double overtime victory against King’s College in Reading, Pa. last week. Colonels coach Trey Brown (Colorado ‘93) enters his first year at the helm of the program in 2014. Brown comes to Wilkes after four years serving as the quarterbacks and special teams’ coordinator at Muhlenberg. In his role with the Mules, Brown was responsible for coaching the quarterbacks, wide receivers, and special teams as well as the installation of the pass game. Prior to his time at Muhlenberg, Brown spent four seasons as offensive coordinator and quarterbacks coach at Lehigh University. The Mountain Hawk offense scored 30 or more points 15 times during his tenure and led the Patriot League in scoring in 2006, when its quarterback was named to the All-Patriot League first team. Brown coordinated an offense that averaged 32.3 points in league games in 2008 and 27.3 points in 2009. Lehigh scored more than 80 percent of the time it reached the Red Zone both seasons, including a Patriot League-best 87.9-percent efficiency in 2008. John Marzka (Allegheny ‘91) entering his eighth season at the helm of the Albright College football program. Named head coach in 2007, he and his staff inherited a 2-8 team and have since directed one of the most impressive turnarounds in NCAA history. The Lions have amassed a 53-25 record and four post-season wins since Marzka’s arrival. His 74% win ratio prior to the start of the 2010 season was the best for any Albright football coach with at least three seasons leading the program, while his 26 wins are the most of any Lions gridiron coach in his first three years on the job. The 2013 season produced a second straight 8-3 record and ECAC bowl victory. A senior-heavy team defeated nationally-ranked Lebanon Valley, falling just short of the MAC championship due to an overtime loss at Lycoming. advantage in the series. Last season the Lions posted a 30-12 win in Reading, Pa. Albright has taken the last three meetings, with the last Wilkes win coming in 2010 in Edwardsville (38-35). Wilkes makes its final trip away from home next Saturday traveling to Owings Mills, Maryland to face Stevenson University at 1:00 p.m. in a Middle Atlantic Conference matchup. • Wilkes has scored 22 total touchdowns through week seven in 2014 after scoring 29 touchdowns in all of 2013 a year ago. • The Wilkes offense ran an NCAA Division III regulation record 113 plays at Delaware Valley in week three posting 35 points in the 54-35 defeat. Wilkes tops the Middle Atlantic Conference running 464 total plays through six games this season. No. 16 Widener follows in second with 439 total plays. • A school-record 12 Colonels caught passes in the game against the Aggies. • The Wilkes offense continues its impressive run through the MAC under the high-octane style of coach Brown and the hurry-up spread attack. Wilkes ranks fifth in scoring offense averaging 22.0 points per-game while ranking sixth in total yards (2,351) and sixth in touchdowns scored (22). The 335.9 yards of total offense ranks sixth in the MAC. • Sophomore quarterback Ryan Dailey is the fourth-best passer in the MAC throwing for 1,500 yards on 125-of-232 passing and seven scores. His 125 completions ranks second in the MAC behind conference leader Tyler Jenny of Lycoming’s 137 completions. His 1,500 yards passing is the most since the end of the 2012 season when Alex George threw for 1,368 yards. Dailey has also shown his dual-threat ability this season rushing for 53 yards and three more scores on 59 attempts. • PJ Incremona has emerged as the top back in the Wilkes rushing attack accumulating 186 yards on 59 carries while scoring four times in seven games. Incremona is averaging 26.5 yards per-game, good for sixteenth in the MAC. • The dynamic trio of receivers of Jeremy Hartman, William Deemer and Jonathan Conklin remain Dailey’s top threats through the air this season. Conklin leads the group with 22 receptions for 230 yards and one touchdown, while Hartman has caught 20 passes for 325 yards and Deemer 21 receptions for 364 yards. Hartman has scored twice while Deemer reached the end zone once in seven games. Deemer and Hartman rank tenth and eleventh overall in receiving in the MAC through week seven. 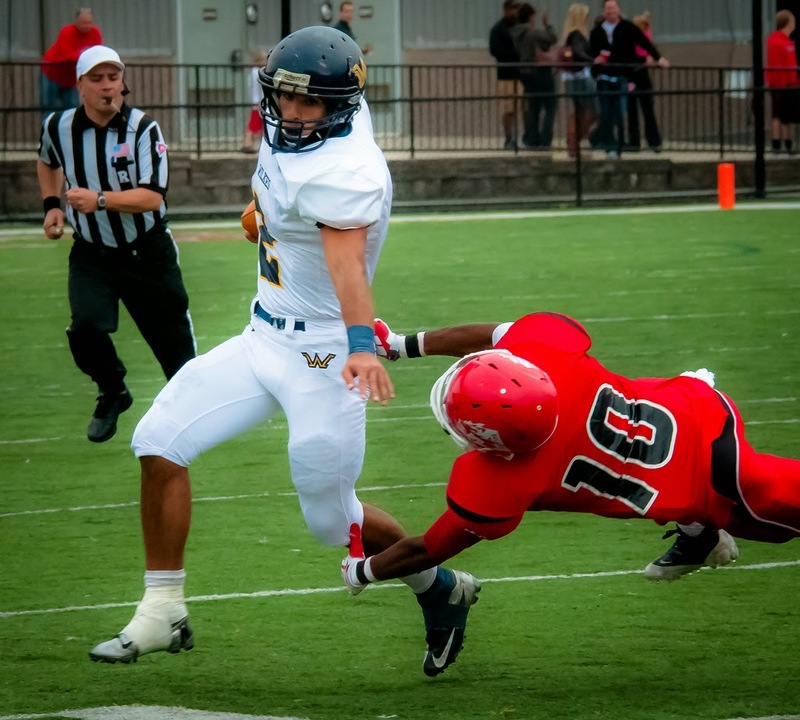 • The Wilkes defense has forced 12 turnovers in seven games including six interceptions and six fumble recoveries. Jared Powell anchors the secondary with two picks and one forced fumble from his safety position. • Linebacker Tanner Stengel tops the Colonels with 62 tackles ranking fifth in the MAC in total stops while leading the conference in solo tackles with 43, five ahead of second place Billy Lewis of Stevenson. Stengel is averaging 8.9 tackles per-game through the Colonels 2-5 start to 2014. • Corner Marcus Leaf has been a shutdown defender on the outside for Wilkes breaking up five passes for sixth best in the league of all secondary. Leaf also accounts for 24 total tackles and one forced fumble in seven games played. • The Albright offense does most of its damage on the ground rushing for ten total touchdowns and 822 yards through seven games. Dwayne Randall leads the list of ball carriers rushing 60 times for 231 yards and two scores. Danny Tighe follows with 41 carries for 22 yards and two scores, while Chris Dawson provides a change of pace with 34 carries and 134 yards and a team-best four touchdowns. • Junior quarterback Pat Wise has thrown for 786 yards on an efficient 78-137 passing including six touchdowns. His 57.4 completion percentage ranks fifth of all quarterbacks in the MAC. • The Lions defensive front features the fourth-best pass rusher in the league as Rich Kuhn has posted 34 total tackles including 12.5 tackles-for-loss and a team-high 4.5 sacks. • Leading tackler Colton Ryan tops the squad with 64 stops (7.5 for a loss) and one pick.